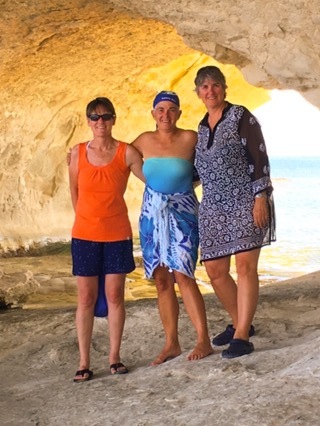 So after a quick catch up with Jo and Liz we set off from the Msida Creek marina towards Fungus Rock n Gozo. 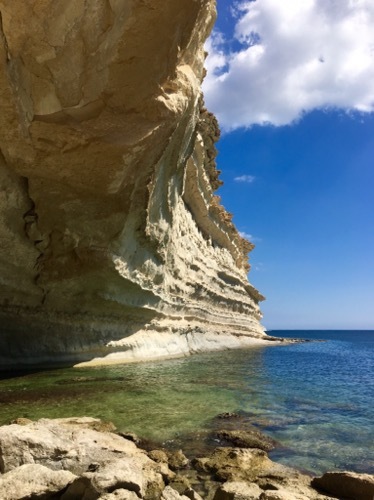 There was not enough wind to sail so we motor sailed, but it was a nice trip along the coast with Jo and Liz providing sightseeing commentary along the way for Malta and Gozo. There were just a couple of other boats in the bay on arrival and a little bit of a swell, but it’s a scenic and quiet location so we decided to stop the night. 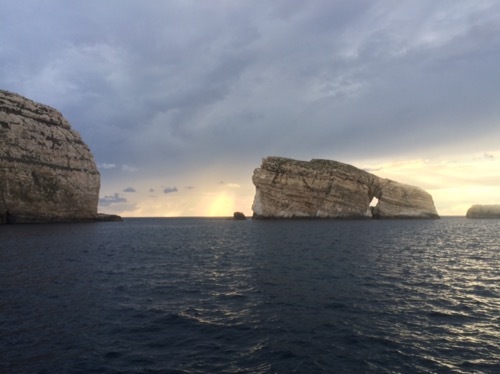 Despite the rain, thunder and lightening arriving soon after we had a lovely meal and evening onboard watching the sun go down and eventually, when the cloud partially cleared, seeing the stars. Jo saw her first shooting star and made a wish, we’re not sure what it was for though! As the worst of the weather arrived during the night the swell in the bay gradually picked up and by the early hours of the morning we were well and truly rocking and rolling. I think a fast spin in a washing machine would be similar to our night, and only the distance from the next available safe harbour plus Liz deciding that the anchor might be caught on a rock (it wasn’t) stopped a middle of the night departure! Cue 4 somewhat grumpy and tired women in the morning and a reasonably early departure with only a passing glance at the Azzure window we had come to see. Jo didn’t say a word but her prediction that the sea state might cause an uncomfortable night in the bay had proved correct! Damn! A lovely downwind sail in the sunshine however improved everyone’s mood and after a few hours we arrived at Il-Hofraz-Z-Zghira. 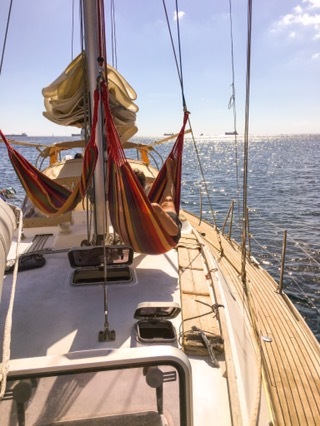 We anchored in the centre with a 360 degree view around us and chilled out. Jo found some energy and donned her scuba gear to clean under the boat, whilst the rest of us relaxed and had a swim. Out came the barbecue as the perfect end to the day. Waking up to a beautiful blue sky we had a lovely chilled out morning – leisurely breakfast, sunbathing and relaxing on Nimrod in the bay. The afternoon involved slightly more activity with a trip out on the tender to see the hole in the rock and the bay on the other side. Liz thought she would slide down the rock in her crocs, sitting down only to stop her descent into the sea! We then went over to see St Peters pool but despite a couple of hopeful attempts our landing options were either a surf in on a tidal wave or to skate over the rocks so we decided to opt for safety and gave stopping a miss. 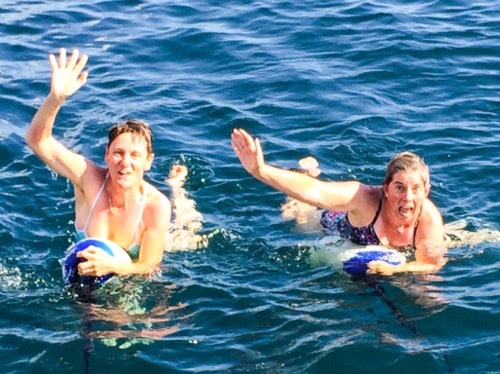 An afternoon swim beckoned instead and the Nimrod Olympics commenced with lilo turns, fender rodeo, scuba brushing, tender flipping and synchro swimming – pure magic! 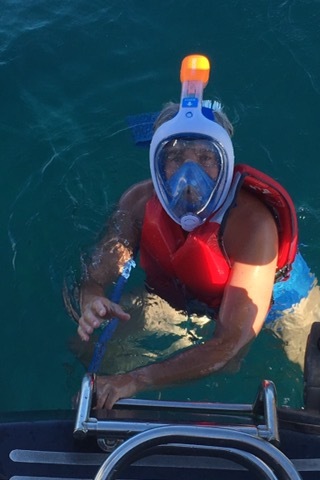 Liz also donned the alien scuba mask to do the other half of the hull scrub. 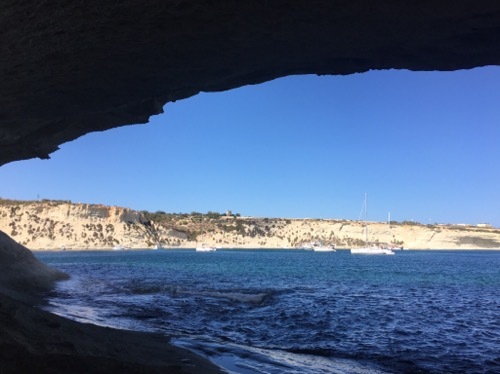 Dinner in the evening was enhanced by the local entertainment including a dog on a paddle board, capturing the Maltese boat going through the hole (which required perfect photographic timing) and super yacht arrival complete with blue lights. A lovely day all round!